Those of us who are senior citizens sometimes voice concern about our country’s future. We wonder if our children will work as hard as our generations did to protect the freedoms and values of these United States of America. 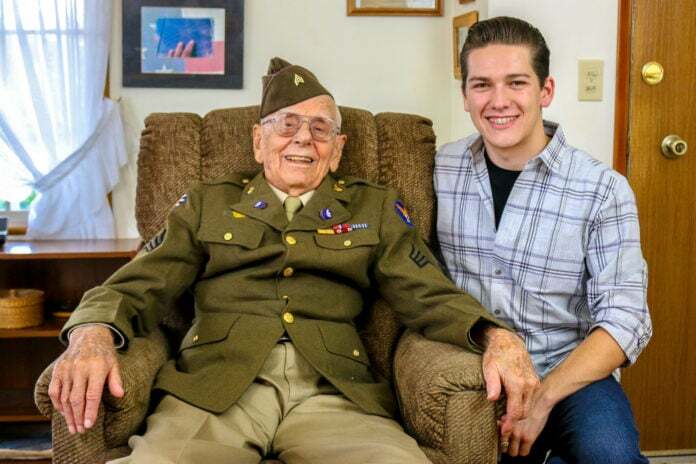 Meeting Andy Fancher, an 18-year-old Duncanville resident who has devoted half his life to honoring WWII combat veterans, is reassuring. 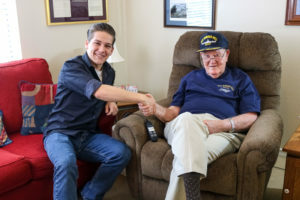 So far, this young patriot has interviewed and documented the stories of 80 veterans on his “Andy Fancher Presents” Youtube channel. And he’s only just begun! 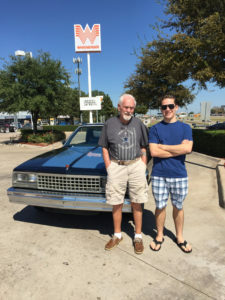 Fancher lives with his parents, Robert and Kellie Fancher, in Duncanville. After being home schooled, he’s now enrolled at Mountain View College. After obtaining an associate degree he hopes to attend the University of North Texas at Denton, majoring in broadcast journalism. When Fancher first started interviewing veterans, his equipment was not very sophisticated. “I started out recording on two different Canon camera models, as well as a shotgun microphone (attached to the primary camera) for audio. I didn’t own any studio lights, and relied solely on desk lamps/natural light provided at the interview locations. Today, I own a 4K Sony camera, two wireless lavalier microphones, and an array of different studio lights,” Fancher said. Fancher said he has attended several funerals, often filming the service, and includes highlights in the veteran’s final video. Last year Fancher was invited by the Gary Sinise Foundation’s ‘Soaring Valor’ program, that provides WWII veterans all-expense paid trips to the National WWII Museum in New Orleans, to accompany a veteramn and former interviewee Gene Odom on his trip. Along with Odom’s wife and daughter, Fancher said their group arrived in the Bayou City on Halloween eve. The next morning they toured the museum, where the old Naval artifacts took Odom back to his days of service. They even found a model of his ship, the USS Hyperion. Fancher also attended Sky Ball XV, a gala fundraiser that raises money for military veterans and families. He was invited by the American Airlines pilot who flew them to New Orleans. Fancher made a presentation to the Sons of the American Revolution (SAR) about his work. The SAR presented him with their Outstanding Citizenship Award, a lapel pin and miniature Liberty Bell. He has also presented programs for the Oak Cliff Lions Club, Lockheed Martin Association of Retirees, and the Commemorative Air Force. Fancher said he has not been able to interview any veterans who were only involved in the Korean conflict, although he has interviewed WWII veterans who later served in Korea. He is also interested in interviewing female veterans, but has not been able to find one who’s willing to share her story on camera. 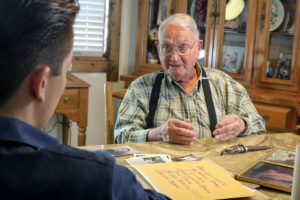 He has interviewed three Vietnam veterans, including Kenny Woodall who served in the 26th Marine Regiment in 1968-69. Fancher said his biggest role model is Andrew Carnegie, whose work ethic, drive, business success and especially his philanthropy he finds inspirational. Andy Fancher has been invited by Friends of the Duncanville Library to present a program July 10. 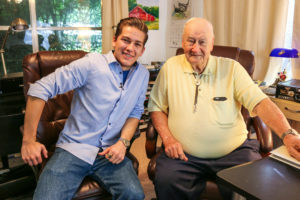 He will show a video interview with one of the WWII veterans he’s interviewed at the event. The program is free to attend, and starts at 7 p.m. in the Duncanville Library Program Room, 201 James Collins Blvd.